Bonanza.com is one of those reputed marketplaces that actually lives up to its promise of work less and earn more for all its sellers. With its tagline that its customers get 'everything but the ordinary', if you are looking for business exposure and optimum exposure of your endless products, integration with Bonanza.com can be your choicest bet! With the tremendous volume of existing sellers, this marketplace does score very high in terms of possibilities for profits and expansion for any enthusiastic venture, whether large or small. With an extended list of products that Bonanza.com accommodates in the varied categories like Antiques, Arts, Baby, Books, Collectibles, Fashion, Health & Beauty and more, your business can bask under the purchase motivated attention of thousands of prospective buyers. A sudden expansion of your visibility and a sudden rush in traffic and conversions is thus with your reach if you sell on Bonanza.com. Why not be best among the Bonanza.com sellers? However, to excel in Bonanza.com, you need to be in tune with the requirements of this marketplace while conducting business in its ever speeding pace. You will have to be thorough with the product listing management as well as updating the same to remain and retain competitive edge over the thousands of other busy sellers. Going the manual way in this very juncture can leave you behind competition and before the canon of extinction. You can nevertheless, change the course of events in your favor by taking the simple step of approaching ChannelSale for unprecedented e commerce solutions. ChannelSale is the leading provider of ecommerce solutions of the 21st century and prides its possession of bang-on technology to ensure skyrocketing any e commerce business endeavor. With ChannelSale, you can find the best Bonanza.com product listing solutions that can automate the process with assured flawlessness. 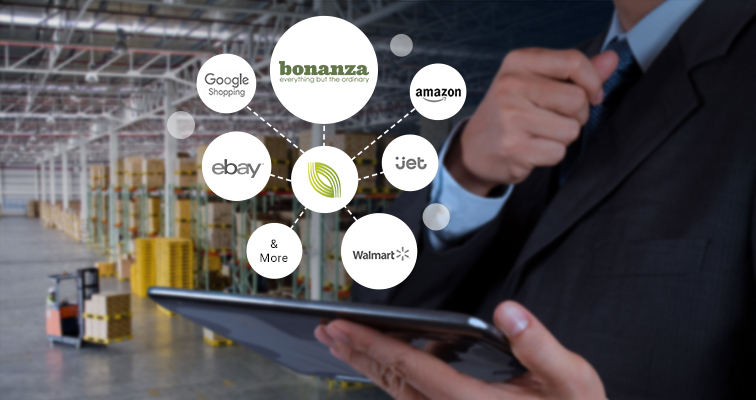 At the same time, these softwares are powered to uplift and automate the entire process of real time inventory management, receiving reports and analysis, checking performance of products in Bonanza.com. In all, the Bonanza.com management tools and softwares from ChannelSale are aimed at speeding all day-to-day mundane tasks while ensuring complete eradication of faulty data transfers and integration with the platform. If you are thinking how we go about the product listing process on Bonanza.com, then this is the answer for you. We create the listing on Bonanaza.com via your product feed file in formats like CSV, TXT, XLS or API-XML. Then we synchronize it with Bonanaza.com along-with the big names among the online marketplaces, comparison shopping engines and affiliate networks. Granular level product category mappings pave the way for apt listing in sync with Bonanaza.com product category. Have variable pricing for Bonanaza.com and other marketplaces / shopping engines, or retrieve your Bonanaza.com pricing to be sent to other shopping engines or markup pricing over cost price. Bonanza.com sellers can seek in higher business benefits with the software solutions that ChannelSale offers! For more assistance call now!